The Public Transport Agency at the Roads and Transport Authority – Dubai has launched a new route between Dubai and Al Ain region. The initiative was organised in coordination with the Department of Transport (DoT) in Abu Dhabi. Officials from the DoT and the Integrated Transport Center (ITC) welcomed the passengers upon their arrival to Al Ain. The new route will fulfil the increasing demand for public transport services between Dubai and Al Ain and will enhance the quality of services offered between the emirates and cities in the UAE, the DoT said. The new route (E201) departs from Al Ghubaiba bus station in Dubai to the bus station in Al Ain with a frequency of 30 minutes. 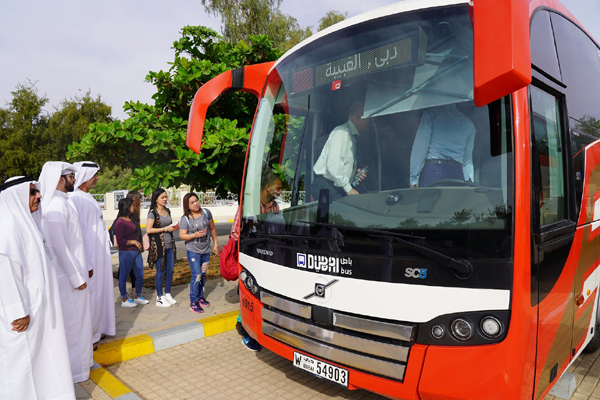 The bus passes by Al Jafiliya Metro Station – north, Wasl, Wasl Club 1, Emirates NBD – Nad Al Sheba, Marmoom Dairy Farm 1, Al Faqa station 1, United Arab Emirates University Mohammed bin Khalifa Street 1, City Petrol Station 1 and Sheikha Salama Mosque 1.